Disc in near mint condition with only a few very light scratches. Castlevania Symphony Of The Night Sony PlayStation PS1 Disc Only Tested. Disc has light scratches does not add gameplay. tested and working. Condition Good. Shipped with USPS First Class Package. Disc and booklet in excellent condition! It is used. The disc is in excellent shape. 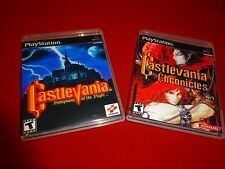 PS1 Castlevania Symphony of the Night Playstation 1 Black Label Complete. Condition is Like New. Shipped with USPS First Class Package. Includes original case and manual. Good overall condition. Plays perfectly. Pictured is the actual item you will receive. CASTLEVANIA SYMPHONY OF THE NIGHT. JAPAN IMPORT. Dracula X Castlevania Symphony of the Night - Sega Saturn NTSC-J release. As pictured disc only. This has been tested and running on a Japanese Sega Saturn unit. Disc is in great shape. Case has sticker residue, surface scratches, and a crack on the back. No Manual is included. Sega Saturn Akumajou Dracula X. Japan Version. 100% genuine Item. With original case and manual. Good overall condition. Plays perfectly. Pictured is the actual item you will receive. Condition: B - Good. Jacket Condition Ozwald’s Gaming & Hobby Zone! Disc only. Other notes %browsepath %. Castlevania: Symphony of the Night (Playstation PS1) Tested & Complete! It is in good condition, especially considering its age(see photos and condition details above). I tested it a couple weeks ago and it still works perfectly. No reserve! Good luck! 5 out of 5 stars - Castlevania: Symphony of the Night (Playstation PS1) Tested & Complete! 165 product ratings165 product ratings - Castlevania: Symphony of the Night (Playstation PS1) Tested & Complete! Disc only. Tested and plays great. Disc came from Gamestop and has been resurfaced. Any questions just ask. Very rare release! Both discs have marks that do not effect play. Plays great disc one has light scratches disc 2 music disc is good condition.